Spring had sprung and bunny season was upon us! It seemed like the perfect time to row The Runaway Bunny! We love Margaret Wise Brown and we were eager to begin this book. I printed and laminated our vocabulary cards from Homeschool Creations’ The Runaway Bunny pack. I created a Story Sensory Box and we were set to row! We read several different Bible stories during this unit. We started our morning on a sweet note with bunny cinnamon rolls. We read about Easter since it was right around the corner. We also read The Parable of the Lost Coin and I hid a chocolate coin in their porridge that morning. The kids had fun finding and eating their lost coin! We read Always Near Me, a picture book about Psalm 139. The kids did a weaving craft (Daniellesplace.com), because we learned how God knit us together in our mother’s womb. I read I Can Praise God and the kids worked on an “All About Me” worksheet. 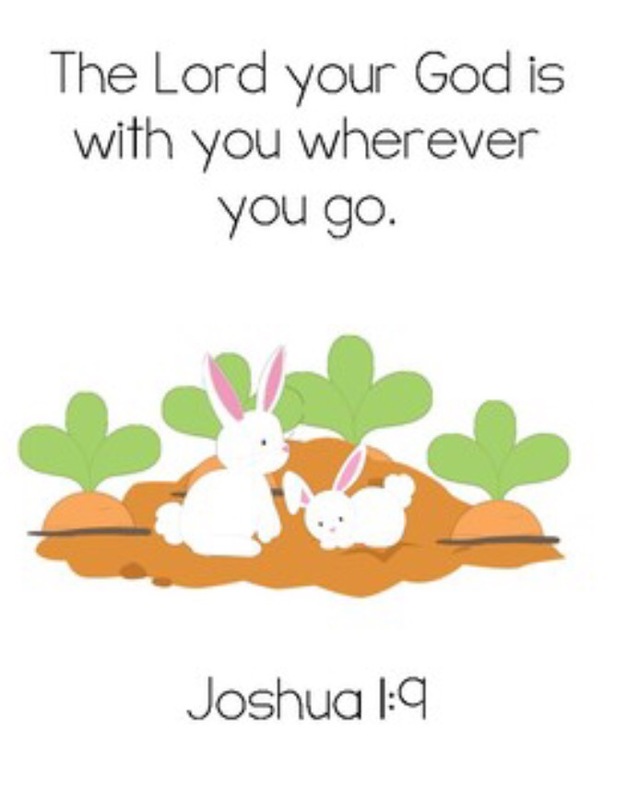 We chose Joshua 1:9 as our Bible memory verse. I created a printable pack just for Parker. You can download it for FREE here! Parker worked on his Bible verse tracer. He also put together his Bible verse puzzle many times during this row. We used a mix of Easter, Spring, circus, and bunny themed printables to work on our language arts activities. Parker worked on syllables, word recognition, reading, and writing. Our Story Sensory Box was decked out with rainbow beans, vocabulary cards (Homeschool Creations), and matching toys/figures. Parker used the Story Sensory Bin every day to work on his vocabulary words. We combined a grammar lesson with craft time to plant a suffix garden. The kids “planted” the root word below the soil with it’s matching suffix carrot top. We read Out for Trout and I set up a fun “ABC Fishing” activity on Learning Lane. I attached paper clips to each letter and placed them in a box with shredded blue paper. Parker went fishing with a magnetic pole. Once he “caught a fish”, he would trace it on his worksheet. You can purchase the ABC Fishing Fun pack at our TPT Store. The boys worked on their story sequence cards (Homeschool Creations) SO MANY TIMES! This was a fun activity to strengthen their memory AND math skills! Though not bunny related at all, I just HAD to add this into our post. Who doesn’t love The Cat in the Hat? Big brother worked on his Cat in the Hat first grade reader and a follow up phonics worksheet. Click here to download our Cat in the Hat FREEbies! Learning Lane had many starting sounds activities for Parker to work on each day. He worked on his CVC spelling activities, crack the carrot mystery word, and a build and spell “bunny” tray. The older kids also joined in on our thematic spelling activities using colored letter beads, worksheets, and more bunny-themed fun! We incorporated circus, bunny, and Easter themed manipulatives to give our math activities a bit more pizazz! We used our Runaway Bunny cards to practice counting, skip counting, and sorting by even and odd numbers. And once again we pulled out our story sequence cards to practice ordinal numbers. We also explored colors after reading Bunny Fun and Corduroy’s Colors. I created a Circus Preschool Math Pack for Parker to work on. You can purchase it here at our TPT Store. There’s a FREEbie in the Preview! I set out a Build, Count, Write tray on Learning Lane. Parker used play-doh to build his numbers, colored gems to count, and practiced writing his numbers on the Circus Number Mats. I set out our Complete the Pattern activity on Learning Lane. Parker completed the pattern then marked the type of pattern. Parker also worked on the shadow match activity in our Circus Math Pack. We read Eric Carle’s Draw Me a Star and explored shapes on Learning Lane. The older kids made gumdrop 3D shapes while watching circus clips from The Runaway Bunny playlist. We continued to incorporate shapes throughout our time rowing The Runaway Bunny. We added some ADORABLE bunny shape printables (Lavinia Pop) to Learning Lane. They were SO cute Parkie cuddled them! I added our days of the week rabbit cards (Homeschool Creations) to Learning Lane. Parker did a great job lining them up. We often sing the Days of the Week song (to the tune of The Adams Family). We explored mountains and meadows as we learned about the various habitats in The Runaway Bunny. We read a few books about meadows and mountains. We brought out Montessori Tree Puzzle and our Parts of the Tree worksheet. I read Trees: Earth’s Lungs and the kids colored their worksheets. Parker put together his puzzle and labeled the various parts of the tree. The kids made a tree snack with fresh fruits and vegetables! We even planted two apple trees in our backyard! We’re growing a memory that will HOPEFULLY yield a yummy harvest one day! We did a little spring-themed garden lesson with crocuses. We brought out our “What Plants Need” sorting activity (Lavinia Pop) . The kids completed the coordinating worksheet and made a “Grow in God” necklace (Mrs. Jones Creation Station). I printed our Label the Crocus Flower worksheet for the kids to color, cut, and paste together. We finished our lesson planting crocus bulbs in an empty baby food jar with glass beads and water. We couldn’t row The Runaway Bunny without studying bunnies. We ate a fun bunny pancake breakfast and read Honey Bunny. We read all about bunnies. I set out our Rabbit Nomenclature cards and a felt bunny puzzle I made. The boys worked on the bunny puzzle. The kids made fun bunny ears out of construction paper and added their name with foam letters. Thn they labeled the parts of the bunny (Homeschool Creations) and added inserts into their lapbooks (Homeschool Share). We also read many wonderful story books about bunnies too! I brewed some herbal tea to serve with our bunny bum cookies. Made clown hats, conducted a balancing clown experiment, walked the tightrope, and played with our wooden circus set! 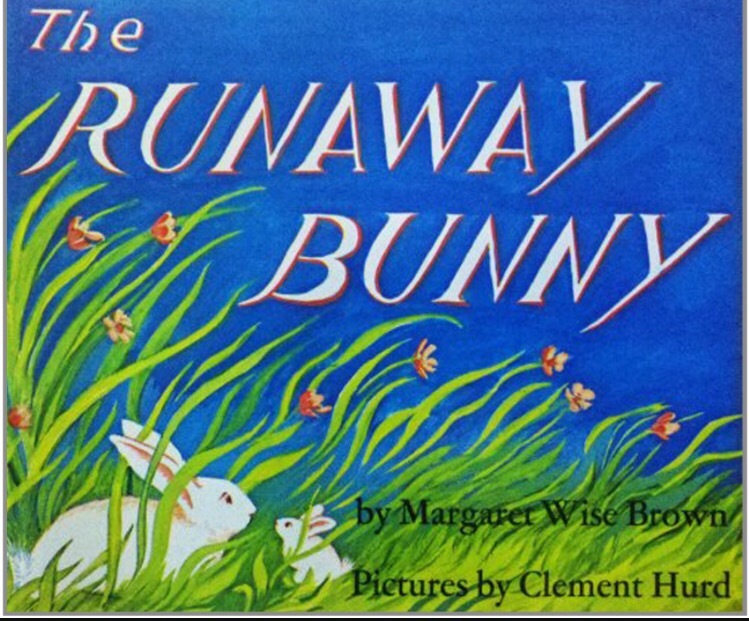 Check out our The Runaway Bunny Pinterest board for links to the printables we used and see the pins that inspired many of our activities!